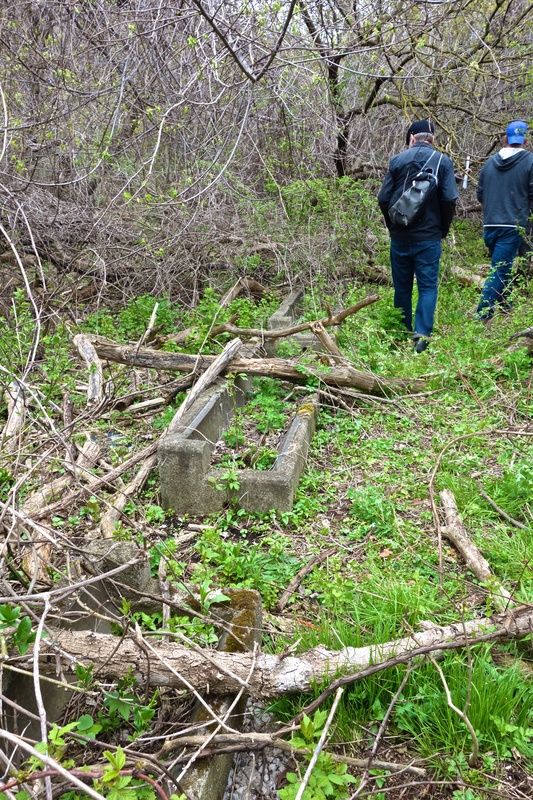 On Saturday, May 7, about 50 people took part in a Jane’s Walk to discover some Weston and Mount Dennis history. The walk led by Mike Mattos featured guest segments from Alistair Jolly, an archaeologist with TRCA, Simon Chamberlain from MDCA and myself. 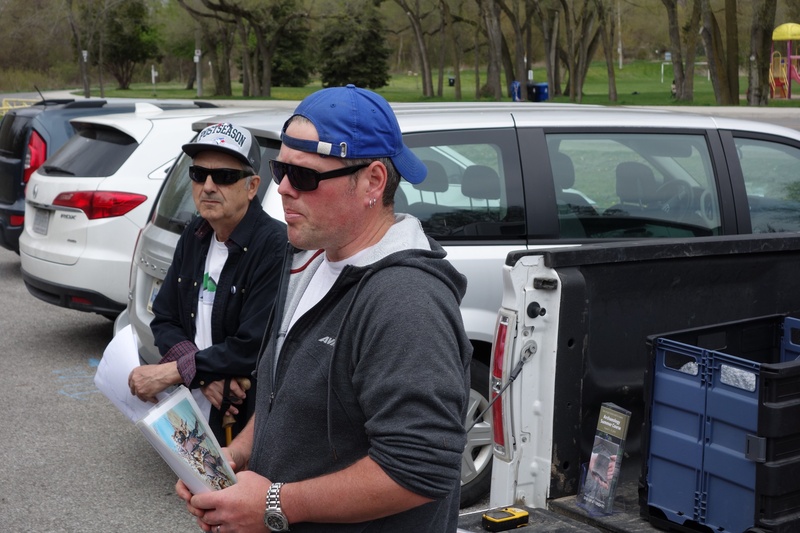 Mike Mattos (L) listens to Alistair Jolly from TRCA with some artifacts discovered in the Toronto region. 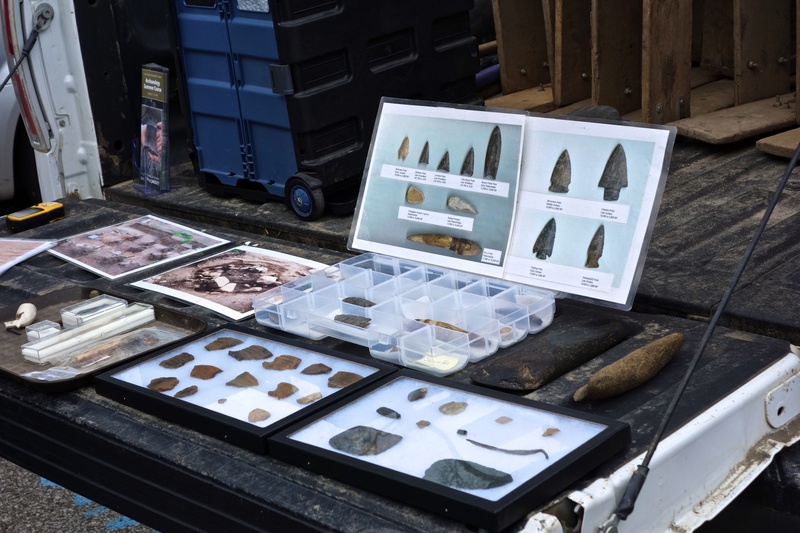 A sample of the range of artifacts discovered around Toronto. 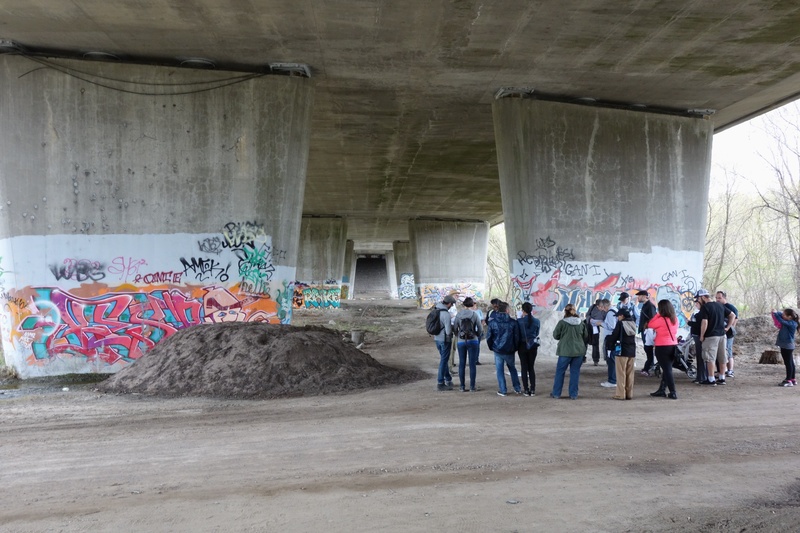 After viewing some artifacts including clovis arrowheads, stone axes and clay pipes, we ventured under the Eglinton bridge at Scarlett Road. Simon Chamberlain discusses the history of the area. A view of the graffiti adorning the walls of the Eglinton bridge over the Humber. Moving up the river from there Mike and Simon led the group to some interesting relics from the early years of West Park Hospital. Established in 1904, for patients suffering from tuberculosis it was then known as the Toronto Free Hospital for Consumptive Poor or the Weston Sanitarium. Since this was in the days before antibiotics, treatment consisted mainly of rest and fresh air. At the time, Toronto’s death toll from TB was considerable; something like 7 people a day. Even then, TB was known to be infectious and city workers fearing contagion refused to collect food waste from the hospital. As a result, the sanatarium set up a piggery and chicken operation on hospital grounds close to the Humber. The farm was self-sustaining and with 1000 hens and 50 pigs, there was no shortage of food. Pigs were slaughtered at the stockyards. Water troughs for the pigs still remain. Antibiotics revolutionized treatment of TB and in 1954, the animals were swept away during Hurricane Hazel but evidence remains of the extensive farming operation that was operated by staff and patients. 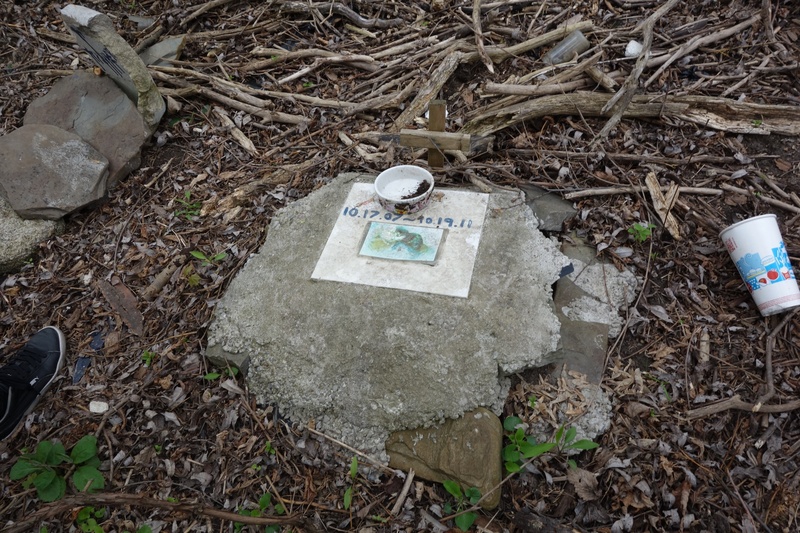 By the river, there is a small informal pet cemetery that apparently has been used by local residents for years. 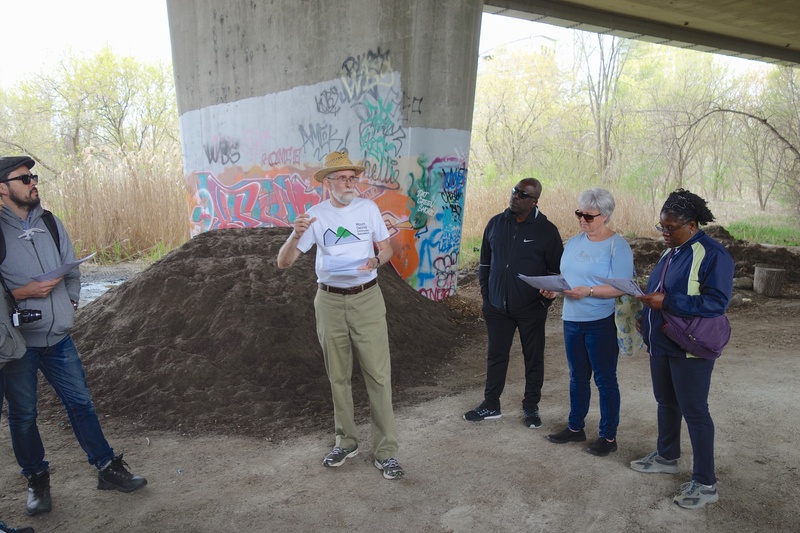 The last segment of the walk ended by the weir in Raymore Park and there was discussion of the effects of Hurricane Hazel on the area which led to the forerunner of today’s TRCA, the creation of many of Toronto’s parks and the preservation of this city’s famous ravines. Another great walk; luckily we had no rain and as a bonus – mosquitoes haven’t emerged – yet! 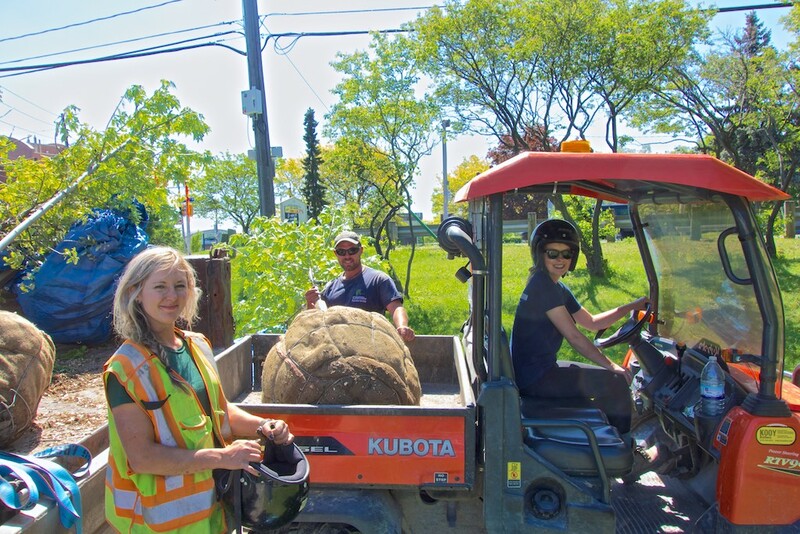 Workers from Toronto and Region Conservation Authority in conjunction with City of Toronto Parks were at work today at the Lawrence Avenue entrance to Cruickshank Park planting red oak trees. These native trees need lots of room and will provide welcome summer shade in years to come. 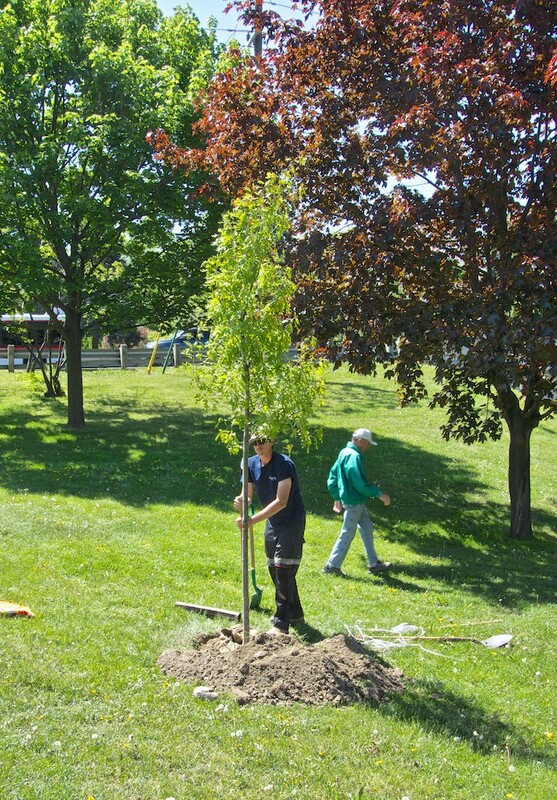 According to Metrolinx spokesperson, Manuel Pedrosa, the trees donated by Metrolinx are marker trees to represent the ones recently planted in the Humber Arboretum. There will be an official ceremony tomorrow at 3:00 p.m. at the Lawrence Avenue entrance to the park. No matter what you’ve been told, strictly speaking, hurricanes don’t happen in Ontario. The fuel that keeps them going is warm ocean water and once landfall is made, they soon become extra-tropical storms and usually fizzle out with a bit of wind and rain – that is if they can actually make it all the way up here. 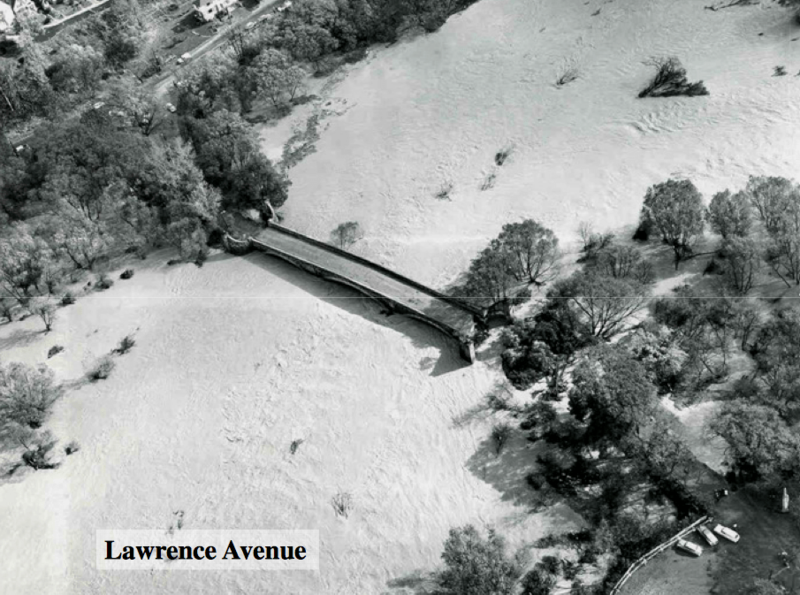 Why then, sixty years later do we talk about Hurricane Hazel and its devastating effects on our neighbourhood? Early in October 1954, a group of clouds that had formed off the coast of Africa began rotating and became a tropical storm. In the days before satellite monitoring of weather systems, there was a great deal less certainty about the path and nature of hurricanes during the June to November storm season. Back then, tropical storms and hurricanes were only detected once they came close to a populated area. 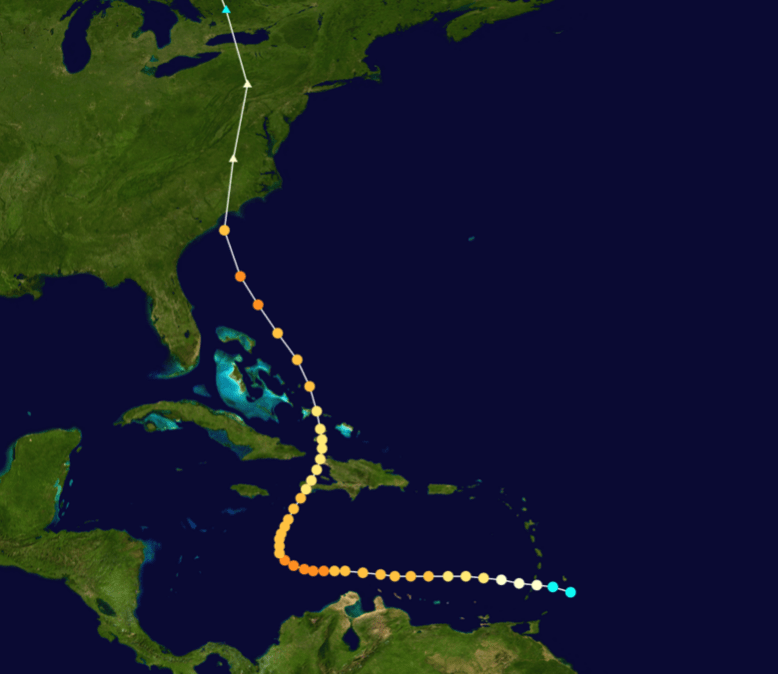 This particular tropical storm was spotted in the Caribbean and being the eighth of that year, was by convention, given a girl’s name beginning with H; Hazel. She quickly strengthened into a powerful hurricane and sweeping through Haiti, Hazel took the lives of several hundred people. Then, dragged north-west by an upper level low pressure area sitting in the Mississippi Valley, Hazel made landfall in North Carolina on October 14th as a category 4 (out of 5) hurricane. Hazel was then expected to fizzle out and become a rain event but picked up energy from the low pressure area and set its sights on Ontario. The track of tropical storm (blue circles), Hurricane Hazel and extra-tropical storm Hazel (yellow triangles). Again, before satellite tracking and computer projections, weather forecasting was something of an art. Although there was some warning about the approaching storm, Ontarians were unprepared for what was to come. Ominously, there had been considerable rainfall in the previous two weeks leaving the ground saturated. On its way to Ontario, Hazel was re-classified as an extra-tropical storm. Even though its winds had weakened, it still carried a vast amount of water. Once over Brampton, Hazel combined forces with the Mississippi Valley system forming a new storm that stalled and unloaded its rain onto the already saturated ground. As night fell, the rain continued, putting pressure on the two major watersheds in the region, the Don and the Humber. It is estimated that a volume of water the size of Lake Simcoe fell on the Humber River watershed alone – and only one escape route – the Humber River valley. As the evening progressed, flash flooding inundated low-lying homes along the Humber. Occasional ice-jams had caused flooding in the past but this was different. The water’s rise was rapid and relentless. By the time people realized that their lives were in danger, it was too late. In Weston, five people perished. On Raymore Drive, just across the river from Weston, a suspension footbridge blocked and diverted a torrent of water into the lower homes on that street and 35 people lost their lives. In one instance, in response to the rising water, a family moved possessions from one house to another only to lose their lives when both homes were inundated. A nearly complete list of fatalities is here. In the aftermath of Hazel, the forerunner of the Toronto and Region Conservation Authority was formed and given the power to clear floodplain homes creating Toronto’s famous park and ravine system. Today, along with many Toronto communities, Weston is blessed with beautiful parkland and sports facilities along the Humber. Raymore Drive now ends at Tilden Crescent but the depressions of the former homes’ basements are still faintly visible in Raymore Park. Native trees and other rain absorbing vegetation are being planted and plans are afoot to remove concrete channels and replace them with natural riverbeds. Even though there is more paving today than in 1954, the disconnecting of downspouts from sewer systems, floodwater holding tanks and the encouragement of green roofs and driveways are techniques that will allow water to be absorbed into the ground rather than quickly drained into the river. 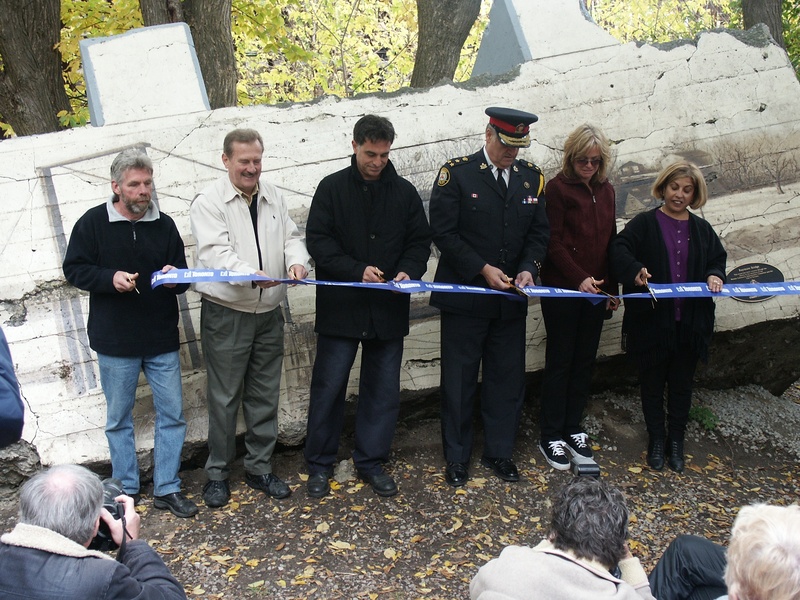 Artist Mario Noviello (centre) assisted by MP Alan Tonks, Police Chief Julian Fantino and Councillor Frances Nunziata dedicate an artistic installation on the 50th anniversary of Hazel on October 16, 2004. Most days, as in the past, the Humber flows gently through our parks and ravines. Even though 60 years have passed and measures have been taken to remove people from the path of danger, occasionally, as on July 8, 2013, we are reminded that no matter how well prepared we are, nature often has the last word. Weston residents wondering what has happened to Humber River salmon this fall will be pleased to know that their arrival is imminent. According to Toronto and Region Conservation Authority (TRCA) workers, the problem has been the antics of downstream wildlife and a recent dry spell. A big obstacle to migrating fish is the 3 metre tall weir/dam in Raymore Park. A few years ago, a denil fishway (aka fish ladder) was built thus extending the migratory range of several species. Unfortunately, beavers stuff the fishway with wooden debris in the hopes of creating a dam. On Friday, two workers were clearing the way for the salmon and told WestonWeb that as soon as water levels rise, these large Lake Ontario fish will be able to access the ladder. From there they will swim upstream to their birthplace, spawn and return to the lake – assuming they can run the gauntlet of people out to get them. Workers clear the upper end of the fish ladder. In spite of their impressive size, salmon will be seen along the Humber as far as Bolton and Palgrave. 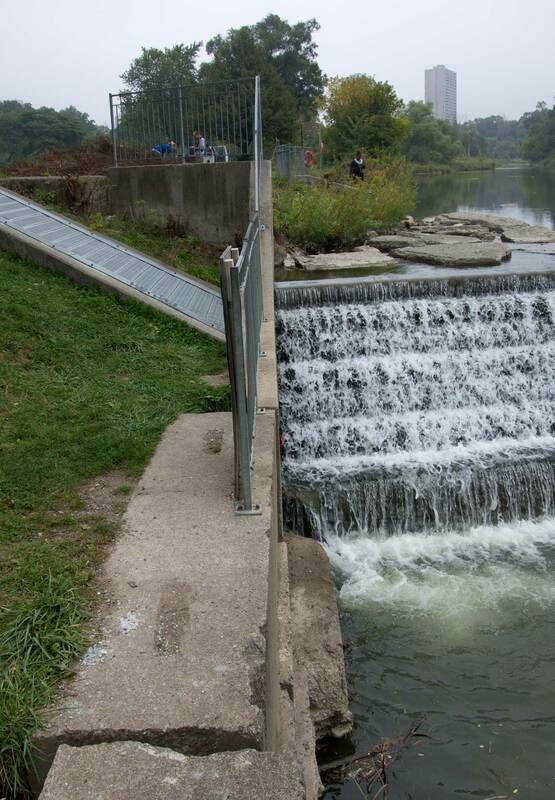 For its part, the TRCA is studying the removal of obstacles to fish migration along the Humber and the weir in Raymore Park is definitely one of them. Probably a good thing as the beavers are relentless in their efforts to block the fish ladder. Water levels and beaver permitting, fish enter at the bottom left of the weir.